Well, that was quick. 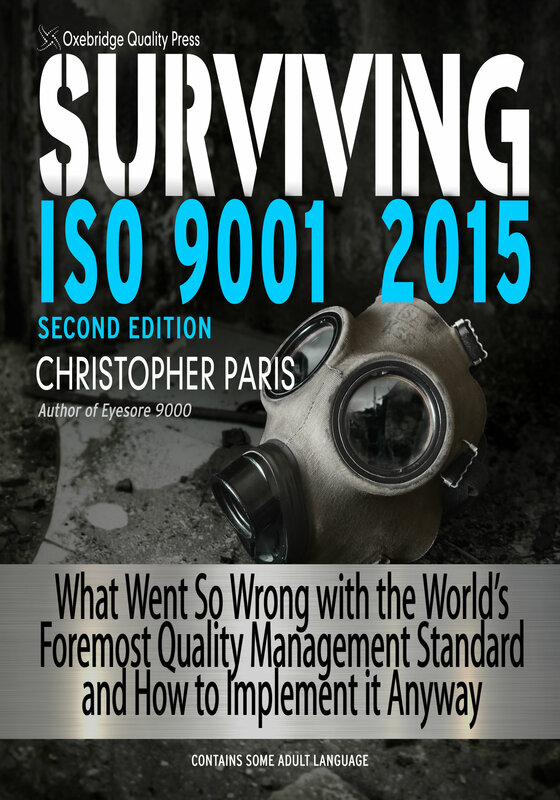 Just yesterday I teased the release of the Second Edition of Surviving ISO 9001:2015, What Went So Wrong with the World’s Foremost Quality Management Standard and How to Implement It Anyway, and now it’s already available on Amazon. This new edition was largely done just to get it in shape for paperback release, so those of you waiting for a hardcopy can rejoice. The Second Edition does add some new material, but buyers of the First Edition shouldn’t feel obligated to buy the new one; I’m not Jack West, for heaven’s sake, releasing new editions every five minutes to triple my sales. As usual, the book comes with an Adult Language Warning, as some f-bombs are dropped. The hardcopy edition came in at 400 pages, with a cover price of $74.99. Amazon requires pricing at the “99 cent” level for some reason. Learn more about the book at SurvivingISO9001.com or just go buy it already on Amazon.